Many panelists pointed out that civil rights was the major issue for Muslims in the 2000 presidential race when Muslims voted en bloc for Bush because of his pledge to address their grievances. “However, since 9/11, the Bush administration policies made the Muslims and Arabs the target of racial profiling, hate crimes and FBI interrogations while their mosques are under surveillance,” they added. 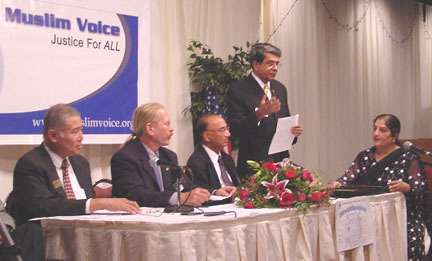 Majority of the panelists agreed that there have been serious civil rights violations of Muslims, Arabs and South Asians under Bush's administration after the 9/11 terrorist attacks. Everyone stressed the need to review and change policies to safeguard America from further terrorist attacks but targeting of the Muslims, Arabs and South Asians was not the direction that our administration has taken. The panelists pointed out that "The USA Patriot Act" was introduced six days after 9/11 and passed merely forty five days after 9/11 without the normal procedures. The Patriot Act provides powers without checks and balances and these powers are being used by the Bush Administration particularly against certain ethnic groups. Soon after the 9/11 attacks, over five thousand Muslims, Arabs and South Asians were arrested solely because of their religion and ethnicity. The panelists also recalled the INS Special Registration of 2002/2003. Over 86,000 people were called in for the INS Special-Registration from 24 countries. With the exception of North Korea, all of them were Muslim and Arab countries. Over 13,000 were detained and most of them were deported because of minor visa violations. However, not a single one was linked to terrorism. There are over seven million illegal or undocumented aliens in USA but our government has decided to deport only Muslims, Arabs and South Asians. This program has caused havoc in the targeted communities, destroying futures, separating families and shattering the American dream of being in a free country. Another matter of concern was the Criminal Law Enforcement of the Alien Removal Act introduced by Republican Representative Charlie Norwood on July 9, 2003. The proposed legislation poses a threat to the rights of immigrants living in the United States and may undermine efforts to make U.S. communities safer. It would compel state and local police officers to enforce federal immigration laws or face restrictions in the amount of federal funding they would be eligible to receive. Local law enforcement officials from across the country have publicly voiced their opposition to this proposed shift in responsibilities. Many officials are concerned that these new duties will compromise their ability to ensure public safety, to sustain community relations critical to local policing, and to fulfill their critical role as first responders in the event of further attacks on homeland security. Even the Department of Homeland Security, the agency in charge of enforcing immigration laws, has expressed concerns about the CLEAR Act. Muslims, Arabs and South Asians are now targets of racial profiling. They are being profiled at airports, in, schools, at work places and in restaurants, etc. All of this has created a culture of anger, frustration, helplessness, humiliation and total despair. Our administration has created a culture of hate, anger and mistrust towards Muslims, Arabs and South Asians in our country and as a result, the hate crime has increased 121% against the targeted groups, ranging from verbal assault to deaths as documented in a CAIR report. Regarding which candidate will get the majority of Muslim votes, Syed Mahmood, a former congressional candidate of the Republican Party, suggested that on November 2nd, we should vote according to our conscience. I, the moderator countered that in reality we cannot afford to vote with our conscience because if she voted according to her conscience, her vote would go to the Green Party since this Party shares similar values of justice for all, a kinder, harmonious, peaceful, healthier and cleaner world. However, I added that since this country is politically divided on the basis of two largest and most prominent parties – Democratic and Republican — a vote for a third party candidate would mean a vote for Bush. I also pointed out that right now I have one goal, "Change of the guard in the White House" so the choice of voting her conscience is not an option. There are three Supreme Court judges that will complete their term in the next election year. If Bush is re-elected, we will end up with more ultra Conservative judges. Even though Muslims, Arabs, South Asians and other humanitarians are not thrilled about Kerry's policies, they have had enough of the Bush administration and are ready for a change. Cecilia Cheng, supporting Senator John Kerry, said that some of the provisions of The USA Patriot Act will sunset in 2005, and Kerry supports that while the Bush administration is against it. Alberto Torrico, Vice Mayor Newark believed that if Al Gore were president, the U.S. would not have had the Patriot Act, and the economy would have been better. However, the moderator reminded the panelists that it was not only the Republicans who passed the Patriot Act but that Democrats were equal partners, with few exceptions. Other panelists suggested that there are few other differences between the two Presidential candidates. Senator John Kerry promises that he will reach out to all ethnic groups, particularly to the Muslim and Arab world. Under Kerry, the current foreign policy will be improved to live up to American values. The questions raised by the audience included: If our President expires, who would be able to lead the country better: Cheney or Edward? Can we deal with Rumsfeld and Ashcroft for another four years? Some speakers believed that a consensus is developing in the Muslim and Arab communities to vote for the Democratic Presidential candidate John Kerry despite certain reservations about his policies regarding the Middle East problem. It was pointed out that four polls conducted during the last four months indicate Kerry’s popularity with the Muslims and Arabs. According to a Sept. 22nd Georgetown University poll, Muslims back Kerry over the incumbent Bush by a margin of 76% to 7% while 11% support independent candidate Ralph Nader, an Arab American. My personal recommendation: I advocate Dave Meserve's theory, "On November 2nd, hold your nose and vote for Kerry." Samina Faheem Sundas is the Executive Director of American Muslim Voice.